In the middle of the woods there stood a cabin. Not one of those small, sad-looking affairs, whose walls are caving in and whose roofs are rotted and full of holes, but a well-built structure with two floors and several bedrooms, all nestled peacefully beside a quiet country lake. For most of the year the cabin remained empty, but come summer the owners would arrive from the city and they’d unlock the doors, open the windows, and laughter and fresh air would fill the cottage from top to bottom. At first there were just a husband and his wife and they were very fond of reading. They turned one of the rooms on the lower floor into a library, stocking the shelves with row upon row of books, each year adding more. There were adventure books and romance books, history books and science books, art books and poetry books, and ever so much more. Great contentment filled the owners when they’d take one of their books and go reading by the lake, for as they read the birds would sing from the trees and the waters ripple softly upon the shore. Now the books enjoyed this as well, and each felt very proud when the owners selected them from amongst all the others to read. They’d make sure all their letters were standing straight and tall, and that no chapter was out of its place. The old grammar book on the first shelf even checked them periodically to make sure their sentences were in good order - though the more modern books would often send it into a frightful fury. In time the husband and wife had a son and daughter, and with them still more books arrived. For a while it seemed a second library would be called for, but then things began to change. First, a noisy little box the people called radio appeared, and then a noisier box they called television, and then one summer they brought the strangest box of all, one which they huddled around incessantly and called computer. Without heart or conscience they placed it on a table in the middle of the library - forcing the books to watch as this new upstart hogged all the attention. “This is intolerable!” said the books, and they sulked and pouted as the dust grew thicker and thicker upon their jackets. Never had they been left in such a miserable condition. But it wasn’t until the people began packing some of them into boxes to give away that they grew desperate enough to act, for most books are really quite conservative at heart, content merely to tell their same story over and over and never raise a fuss - unless, of course, they’re pushed too far. There was an excited fluttering of pages, and a small electrical pamphlet stepped to the rim of a high shelf. Spreading wide its covers, the pamphlet glided gracefully down to the light switch, flicking it on as it swooped past. Immediately the room filled with light, and the ring of shelves crawled with motion as each book shuffled forward to gain a better view. There was much pushing and shoving, and a collection of bedtime stories had to remind them all to quiet down lest they wake up the entire household. The Law Book flapped its thick covers like a fat crow and awkwardly dropped to the table top below, landing heavily on its face with a loud plop. The children’s books giggled at this but were quickly silenced by the stern looks they received. This, after all, was serious business and all were expected to act accordingly. Standing itself up again, the Law Book cleared its throat and waddled across the table to the silent computer. “Wake up, you demon!” the book demanded, and instantly the computer awoke with a click, its monitor growing brighter by the second. The book being addressed was a Dictionary, and with prompt efficiency it laid itself flat and began rippling through its pages till the appropriate one was reached. “Obsolete!” it declared - with more than a touch of self-importance - “adjective: to be outdated; antique; extinct!” Its voice cracked a bit on the last syllable as a low, unpleasant murmur spread throughout the room. There was more last minute fidgeting and then the Law Book commenced his argument. “I shall begin at the beginning . . . ,” he began. “But why at the beginning?” interrupted an old book from an upper shelf, its first few chapters having long ago been torn off and lost. “Are you implying that those with a beginning are better than those with just middles and ends?” The handful of other damaged books promptly echoed its objections. This stopped the Law Book in mid-sentence. It cleared its throat, and with a polite bow to the offended, started again. “For the benefit and completion of the record I shall elect to begin at the beginning . . . which is not to say that the beginning is more important than the middle or the end, but just merely the beginning and a convenient place in which to start.” The torn books seemed satisfied enough with this and settled back down. “And the air hockey game!” added a sports book, with not quite full disapproval. “Here! Here!” shouted the books. Muffled sobs sounded from a sealed-up carton on the floor, while from the back of the room a row of romance novels began bawling hysterically. “But it’s true,” the computer insisted. “You say the owners no longer write: that’s not the case. They do write, only they write on me instead of in their journals and diaries. They can play games on me, talk to their friends on me, they can see pictures of places all over the world.” Then, as if by magic, fantastic vistas of famous sites began crossing the computer’s monitor, each one crisp and colorful. “We see nothing wrong with pictures,” protested a group of picture books, their glossy pages rustling. “Pictures are for illiterate minds,” the Law Book pompously proclaimed. “That’s different! That’s different!” the flabbergasted Law Book fussed, and in the process he tripped over the mouse pad and again fell flat on his face. Once more the children’s books giggled. 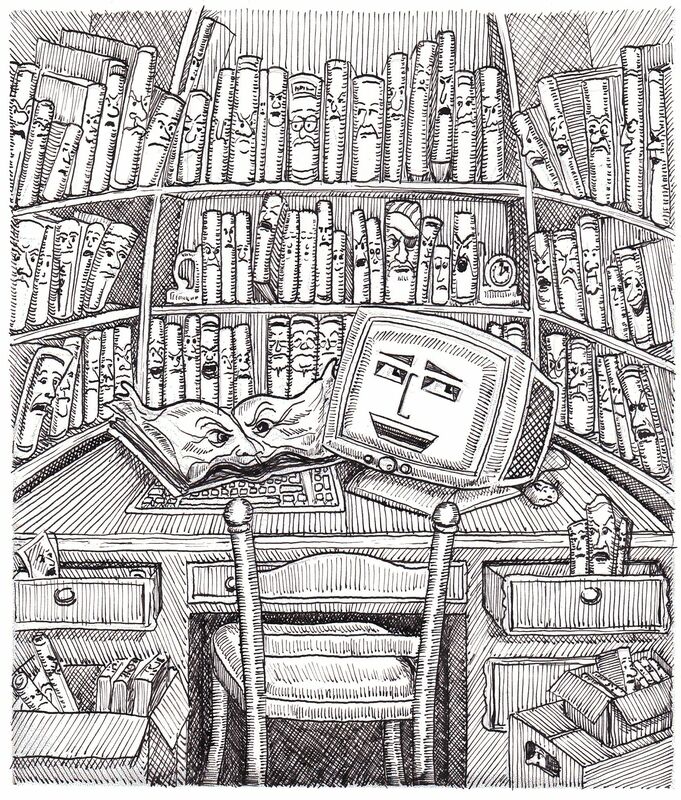 In a flash there appeared on his screen copies of books old and new, some which even lined the bookshelves in the cabin. Oh what a hue and cry this caused, the alarm and horror growing with each flashing, electronic page. “Monstrous!” gasped the books. “It’s unnatural!” “It’s sacrilege!” The computer even began showing off pages that looked remarkably like an encyclopedia. “May we say something?” asked a clump of abridged books, stepping from the shadows. The abridged books slunk sadly back into the shadows. The books didn’t like this suggestion at all and started jumping up and down on their shelves until the bookcases withdrew their statement. “Guilty! Guilty!” chanted the other books, the muffled cries of the boxed books joining in most passionately of all. And one by one the books began flapping their covers and leaving the shelves, chanting “Guilty! Guilty!” as they headed ominously towards the new computer, so angry their i’s were turning red. The computer was in a fix now, but as they hovered around like a swarm of angry bees, a loud booming of cannons was heard, with a blasting of horns right behind it. Lights flicked on throughout the cabin and there was a rush of approaching footsteps. In a flurry of ruffling, rustling pages the books darted back for the bookcases, some landing sideways and some upside down, nearly all of them out of order. It was just in time, for a moment later the people rushed into the library, bouncing off each other getting through the doorway. The children cast suspicious eyes over the bookshelves - noting their disarray - but kept their thoughts to themselves. The next day brought more troubles. When the people awoke they discovered their new computer now wouldn’t work at all. It wouldn’t even turn on. They were much distressed, especially the children, who again cast suspicious glances at the bookshelves. But the books were just as mystified as the people, for after the excitement had died down they hadn’t moved an inch - other than to straighten themselves out. “Did you do something to it?” a detective book whispered to a spy thriller, knowing his friend was often involved in such clandestine operations. So they had to. And after a few days, first the parents - and then the children themselves - began picking up the books again and reading; and before long they were openly asking themselves if perhaps they hadn’t been a bit hasty in their decision to get rid of them all. By the end of another week they were quite sure they’d been too hasty, and after several requests the children were allowed to open up the sealed boxes and return all the books to the shelves. It was a week after this - the last day of the people’s vacation - that the computer suddenly began working again, starting up just as mysteriously as it had shut down. It was then that the books understood, the wisest of them first, but then row by row the idea spread until they all understood and were grateful. “We would like that,” said the books. “Me too,” said the computer. The people prepared to leave. They wrapped the computer up and loaded it in their car. They packed in all their clothes and gadgets - squeezing in a book or two as well. The windows were shut and the shades pulled, and then the doors closed and locked and the car pulled away. Back in the cabin the books sat alone on their shelves. They looked down upon the empty table and there was a sadness in their hearts, and with great surprise they realized how much they missed their newfound friend. From the back of the room the romance novels began bawling once again.